What is Jango Fett's relation to the Death Watch in Disney Canon? In Legends canon, the Death Watch was a rogue faction of Mandalorians who had rejected the Mandalorian standards of honor and were notorious for their brutality. They were directly responsible for the death of Jango Fett's family, thus leading to his adoption by Jaster Mereel. It is also established that Mandalorian armor is more or less the same design, but customized by each warrior and therefore different colors according to individual taste. In Jango Fett's case, he inherited Jaster's blue & silver armor when the older man was killed in battle. He then discarded his old green armor for the blue & silver set to honor his adopted father. In the new Disney canon, however, the Death Watch is a rogue political faction that rejects the pacifist policies of Duchess Satine of Mandalore. The relationship with Jango Fett is not mentioned, but all members of Death Watch can be seen wearing armor nearly identical to that of Jango Fett, with the "normal" Mandalorians wearing a slightly different design of armor. So this leaves me with the question of why Jango Fett was wearing what, in effect, was a Death Watch uniform when he should have been wearing a different style of armor altogether. Or maybe it's been explained that the armor is an older style favored by old-school Mandalorians, but I must have missed that part if so. In the new Disney canon, what is the relationship (if any) between Jango Fett and the rogue Death Watch faction on Mandalore? @pablohidalgo: The Fetts aren't Mandalorian, though I suppose Jango claimed to be from Concord Dawn at some point. Obi-Wan: I recently encountered a man who wore Mandalorian armor: Jango Fett. Almec: Jango Fett was a common bounty hunter. How he acquired that armour is beyond me. Star Wars: The Clone Wars Season 2 Episode 12: "The Mandalore Plot"
It's doubtful he was a member of Death Watch, who seem to be an exclusively-Mandalorian1 group, but it doesn't mean he wasn't affiliated with them in some capacity; what sort of affiliation that could be is, at time of writing, unknown. Where he got his Mandalorian armour, and why he uses it, has yet to be revealed in the new canon. One of the big clans in the Mandalorian’s history is Clan Fett. A familiar character from the Old Republic during the Mandalorian Wars is Cassus Fett. Whatever happened to the clan up until the Clone Wars is a mystery to me. But I can assure you Jango Fett is Mandalorian. Concord Dawn itself is a Mandalorian colony, if I remember correctly. As for Jango’s armor, his armor was green but when the True Mandalorians where annihalated and Jango was sold into slavery, the govenor of the planet that sheltered the Death Watch kept Jango’s armor and had it refurbished and painted to its blue and silver look. When jango escaped he reclaimed his brand-spanking new-looking armor and took revenge on Tar Vizsla. Not the answer you're looking for? Browse other questions tagged star-wars character-similarity or ask your own question. 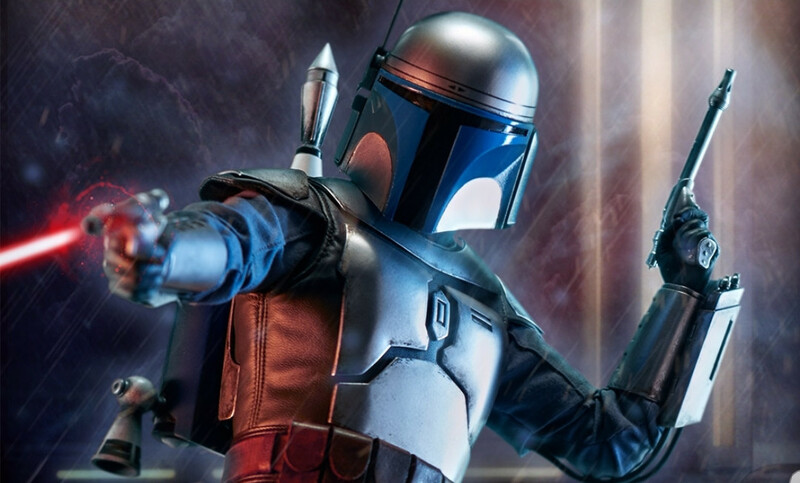 What are the visual differences between Boba and Jango Fett's armor? In The Clone Wars, is Jango Fett still Jaster Mereel's protégé /adopted son? Why did Palpatine choose Jango Fett's gene to create Clone Army? What Star Destroyer classes exist in Disney canon? Does the Imperial pro-human stance exist in Disney canon? Are Chiss in Disney canon?